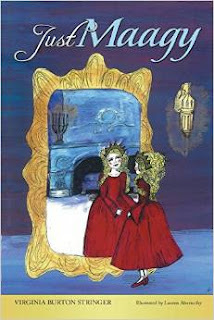 Just Maagy by Virginia Stringer is a story about 13 year old princess Princess Melania Abigail Alice Grace or Just Maagy. Maagy is a spoiled young lady whose aging father King Henry has given her everything she has ever wanted. She knows no bounds and insists on everything and anything going her way. On the morning of her 13th birthday she throws a tantrum because there was no spomoni ice cream and that was one of the things she wanted right NOW. It didn't matter that it was being made and would be ready for her birthday party that very day. After witnessing too many outbursts, tantrums and blatant disrespect thrown at his staff he makes a hard decision to send the Princess away so that when he is gone she will be the perfect one to rule the kingdom. Grandpa Kris and Grandma Polly are at Summer Castle and ready to teach her the things she will need to rule in the proper manner as her father has. She will learn how to be kind, resourceful, patience and above all else humility. This is where the story gets really good! The Princess will meet all kinds of characters that will change the way she views the world and herself! My kids and I read books together and this was really fun to read with them. The vocabulary was great and thankfully Virginia gives us a glossy with characters, terms used in the book and a fun Huggermugger lesson on words in the back. We referred to these pages often. The next time I am in Brooklyn I am dying to take them to Spumoni Gardens so they can finally try Spumoni. If you are looking for a great book for your daughters to read this Summer. This is one! Disclaimer: I received a complimentary copy for my honest opinion. No monetary compensation was offered or received.